The National Theatre is inviting primary schools looking for inspiration for their end of term play to take part in its Let’s Play programme. Let’s Play provides everything that teachers need to create an outstanding piece of theatre and inspire creative learning across the curriculum. Schools signed up to the programme can send up to four teachers on a theatre making course led by professional theatre artists and get access to specially commissioned scripts,musical scores and backing tracks for original songs as well as curriculum-linked teaching resources for Key Stage 1 and 2. 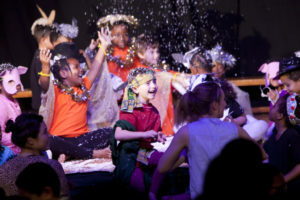 Schools can choose from a selection of plays including some that are perfect for the celebrating end of the autumn term, including The Snow Queen and Operation Christmas. Children taking part will be able to get involved with all aspects of planning and creating a theatre production – from performing to designing costumes to operating sound.Let’s Play offers the whole school community the chance to celebrate the creation of a school play and the achievements of all involved. The National Theatre is aiming to recruit hundreds of schools across the UK to take part in Let’s Play over the next three years. Danae Gardner, a teacher at Harris Academy East Dulwich, who took part in Let’s Play last year said, “Taking part in Let’s Play has really brought the school community together and opened everyone’s eyes to why taking part in high quality drama projects like this is important, and really worthwhile. Our teacher’s confidence in their ability to stage big professional performances has gone through the roof, the children have realised their potential and are more excited than ever about drama”. 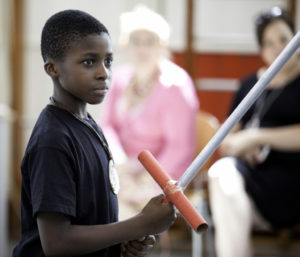 Lisa Burger, Executive Director at the National Theatre said, “The school play is a very special moment in every child’s school experience and Let’s Play has been developed to support teachers across the UK with the resources, skills and confidence to create an outstanding piece of theatre with their pupils. We believe that the arts play an integral part of school life and that all children, wherever they are in the UK, should have the opportunity to see, create and explore theatre as part of their core education”. Schools are encouraged to visit nationaltheatre.org.uk/letsplay to find out more about the programme and to register to apply. Recruitment for this year’s Lets Play programme is ongoing – however school teachers signed up by the 1st October can take part in the CPD in mid-October and produce a play at the end of the autumn term.